Now that I finally have all the photos from my old website available here, I can get back to researching again! Since I haven’t done any real research in years, I’m finding new tools on the web and new information that wasn’t available previously (or at least was much harder to find…) Ancestry.com is a good source of information, but quite expensive to join! I did join, and it’s yielding some great information, but I was disappointed in the difficulty in pulling information off the site to include in my database. WikiTree is another good source of information. I found my father’s, Robert Baker, address in 1958. I was born there the following year. I found an obiturary for Mabel (Baker) Larder with some information I did not already have. From a marriage license for Ferdinand Ewald Joachim and Charlotte Mary Rothweiler, I got the name of my great great grandmother, Charlotte C Grose. I learned that my great great great great great grandfather John Clendenin was a Sergeant in the Third Pennsylvania Regiment Continental Line during the Revolutionary War, and that he was born in Ireland. I was finally able to identify who was who in the photo above. 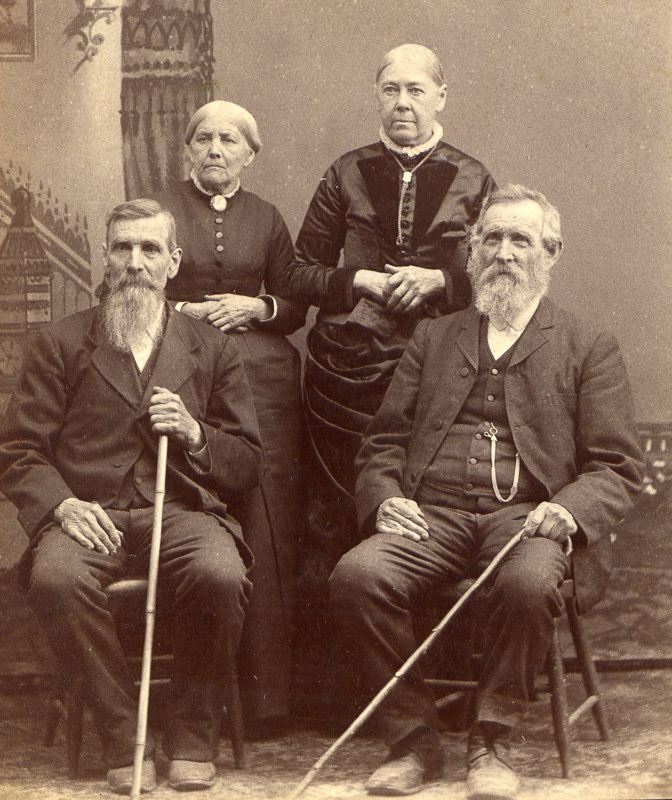 They are, left to right, John Andrews, his wife Mary McClelland, Ann Duncan and her husband Arthur Andrews. John is my great great great grandfather, and Arthur is his twin brother. I always knew that all four people were in the photo, but I was never sure before which one was which! These are all small things, but they open up more avenues for research!